Haven’t we all experienced that a horse pulled you towards some grass in order to grab a few bites? Isn’t that annoying? I think it is. I didn’t want to be pushed around anymore by my horse every time there was some juicy patch of grass growing around. Grass is everywhere! I decided to look for a proper, force-free way to teach my horse more desired behaviour around grass. I tried a few different approaches, before I found one that works well, gave me a solid result and is totally force-free. I would like to share it with you. It took me a while to teach Kyra to behave ‘properly’ around grass. With ‘properly’ I mean: no more pulling me towards grass, wait until I give the ‘graze’ cue and ‘stop grazing and come along’ if I ask her to. I was tired of pulling Kyra off the grass. What really helps is already have a solid history of click & reinforce. Secondly a horse that walks with you properly and the key lessons ‘head lowering’, ‘patience’ and ‘targeting’ are required to make this challenge most likely to succeed. I started to reinforce lifting Kyra’s head while grazing. Why? Because this is the first step to move away from the grass. I began with leading her to grass and I would cue her to graze. Then I just waited (very, very patiently) until she lifted her head by herself. That is the moment I wanted to capture and reinforce. I can’t stress how important it is to wait until the horse moves (his head) away himself. I tried other methods like pulling the head up/preventing the head from going down or asking Kyra to target while grazing in order to lift her head, but reinforcing her own head raise worked best. Every time she would lift her head , I clicked and reinforced Kyra with a very high value treat. One that could compete with grass. After she ate the treat I immediately gave her the cue to ‘graze’. Here is when the key lesson ‘head lowering’ comes is really handy. I also clicked and reinforced the ‘graze’ cue. But instead of offering a treat off of my hand, the reward was to graze as long as she wanted. Every time she would lift her head again, I clicked, reinforced and would then give her the ‘graze’ cue. After a certain amount of training sessions, which Kyra enjoyed very much (! ), I noticed that she started to lift her head more often during grazing sessions. This is a perfect time to add a ‘lift head up’ cue. The key lesson targeting helped me a lot. In this way she is always reinforced for whatever I ask. After several sessions I noticed that Kyra didn’t seem to mind lifting her head up anymore. She was eager to see what I had to offer her. The ‘diving into the grass’ behaviour was gone. She seemed so much more relaxed on grass. I thought this would be the perfect time to raise a criterion. Now I wanted to lift her head and take one step forward before I gave the ‘graze’ cue again. I literally built this behaviour step-by-step. The final step in this process was to teach her to wait for the ‘graze’ cue when we would walk on or approach grass. Now I can ask Kyra to leave grass at any time. She is very willing to come with me. She never pulls me towards a patch of grass and I never have to pull her off of the grass. Win-win, for her and for me. Kyra turned from a I-need-to-graze-now-and-store-fat-before-winter-comes-horse into a I-see-grass-so-what-horse. She knows she can trust me and is allowed to have her share… only when I say so. Contact me (hippologic@gmail.com) if you want me to show you how you can teach your horse to do this! 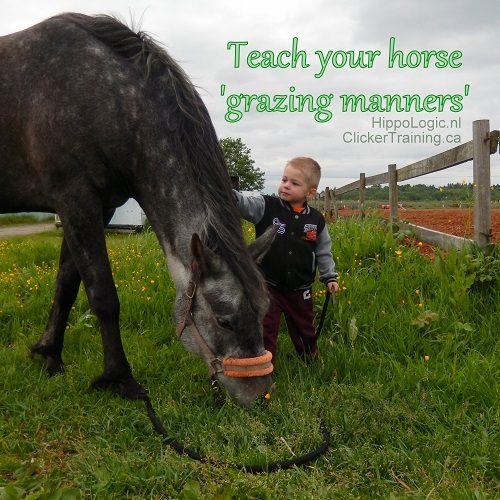 How did you teach your horse to ignore grass? Share it in the comments. If you want to get to know me or have questions about clicker training your horse, book your free discovery call. Plan your call in my calendar.